The other night Linda and I headed to Fremont, NE for Fremont Days. They have a night glow at a local church. I went hoping to capture some images. Obviously this is not one of them. I thought my pics were not all that great - though I will try to find some acceptable images - but this is from the next evening from my deck. As I was watching a beautiful sunset two balloons lifted up in the valley. I grabbed my tripod and camera and went to work. As I looked through the 300 afs f4 I recognized one of the balloons. 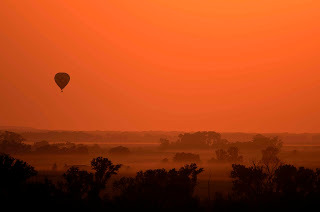 It was the same balloon that Linda and I had ridden in last year. If you ever want a great experience with a passionate pilot try Matthew Grote at Absolute Balloon Tours. This guy is super fun. An excellent pilot. And he likes to fly over rivers instead of over houses. You will love it. Tell him Mark sent you.